Have you ever wondered what some of your body parts do? How many times a year your heart beats? How big your small intestines are? Which of your muscles looks most like a slug? 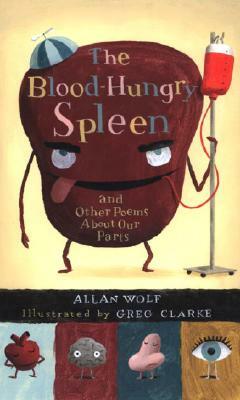 Certain to appeal to elementary-school children, these thirty-four humorous, anatomically accurate poems explore the workings of our bodies with great verve and enthusiasm — and plenty of outrageous illustrations. "Allan Wolf says he can recite 1,000 poems from memory. He began working on THE BLOOD-HUNGRY SPLEEN while teaching a sixth-grade life-science course. The class created a life-size body chart with a poem for each part, and since then, he says, "the human body has proved to be an infinite universe of poetic inspiration." Allan Wolf lives with his wife and three children. This is his first book. Greg Clarke says that when he first read this collection, he was drawn to the whimsy of the poetry. About his illustrations, he says, "It was fun to personify body parts and a challenge to figure out how to depict their more delicate functions." Greg Clarke works as an editorial illustrator for magazines.